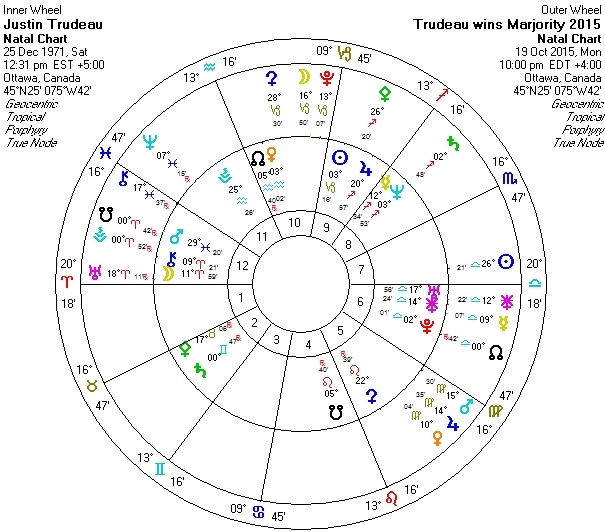 Working under a Saturn opposition and a Uranus opposition, Justin Trudeau wins Canada’s top job by a surprising landslide victory. No one expected a majority rule, but that’s exactly what we have. The 12:31 pm birth time comes from Anne Massey who tells me Lynn Maddox got the birth time directly/verbally from his mother Margret Trudeau. Chris McRae informed me that the birth time of 9:27 pm was published by the newspaper. I have worked with both but feel that Aries rising is appropriate – just look at him! (He looks like Roman of yore to me!) To me, the election transit Moon/Pluto falling in his 10th house is appropriate for winning the election for the stewardship of the country. Note that the 12th house is a house of ultimate path of service and is often an indicator of career. 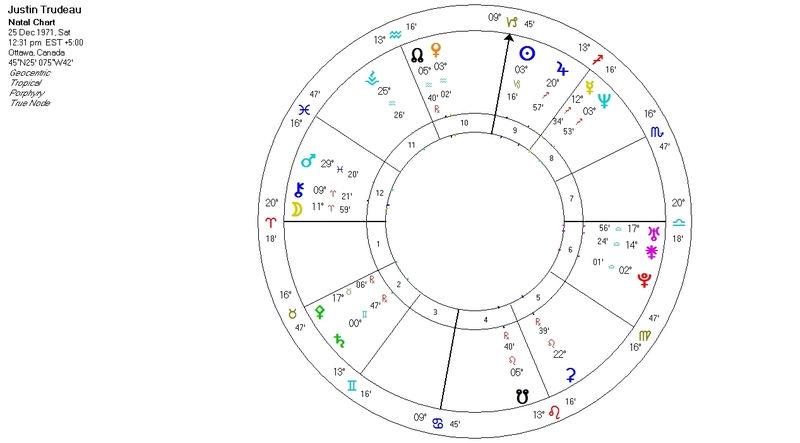 The north node is conjunct his 6th house Pluto (a service house) and trine his 10th house Venus/north node – he is well liked and destined for public service/politics. “Tonight we’ll dispense with the formalities. I’d like to toast the future prime minister of Canada: to Justin Pierre Trudeau,” This toast was made in April 1972 by then President Richard Nixon at a gala buffet during a state visit to Ottawa when Trudeau was just four months old. He has been a teacher, an activist, and as of Nov 4, 2015, holds the most important public service job in Canada. The first born son of one of Canada’s most colourful and noted Prime Ministers, Justin Trudeau has made history by being the first child of a former Canadian Prime Minister to also hold office. He is the second youngest to be elected by the Canadian people. He has also made history by appointing the first gender parity Ministerial cabinet. When asked why this was so important, he said “because it is 2015”. He introduced his cabinet, which includes aboriginals, ethic minorities, a disabled member, and a former refugee by saying he appointed a cabinet that “looks like Canada”. Born on Christmas day, Justin’s birth was also a notable from the fact that at the time, men were barred from attending the birth of their children, but upon strong protest from Margaret Trudeau, Canada’s hospital policy was changed. As is befitting his Aries rising, his moon and Chiron in Aries, it seems his life is destined for a number of firsts. The passion between his parents defied the thirty year age gap, but the demands of his father’s public office proved too confining for his free spirited mother and led to his parent’s no contest divorce when Justin was five. His father gained sole custody of the three children. Of his mother and father’s marriage, Trudeau said in 2009, “They loved each other incredibly, passionately, completely. But there was 30 years between them and my mom never was an equal partner in what encompassed my father’s life, his duty, his country.” Justin is of the Pluto in Libra soul path generation. Natal Uranus and Juno, the marriage asteroid, are also in the sign of Libra. Pluto, Uranus and Juno in Libra are signatures that bare witness to relationship inequality. In the sixth house, these signatures look to correct and heal this disparity. 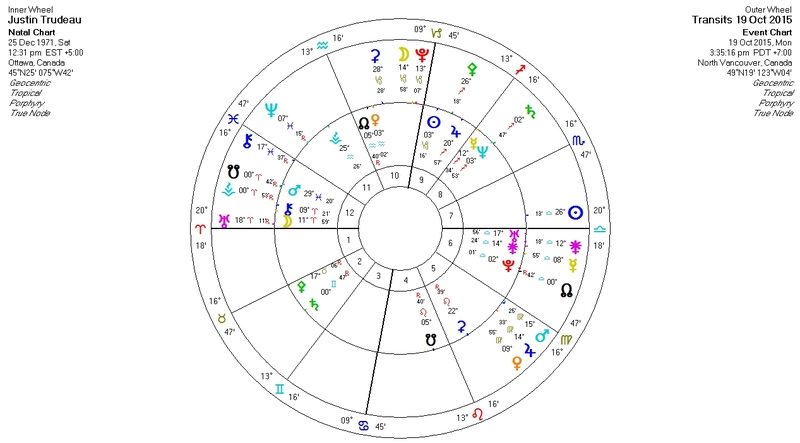 The divorce of the parents can be seen by many chart details such as Chiron in Aries (a singular or separate influence), Venus conjunct the north node in Aquarius in the 10th house, Moon opposition Uranus. Noting Chiron conjunct the moon in Aries and opposing Uranus in Libra, we can surmise that early life (Aries) experiences have included some emotionally traumatic experiences. Certainly children take a direct emotional hit when the parents are too busy (father’s demanding career), when the parents are overly consumed by their own private challenges (suffering from extreme bouts of depression, the mother’s bi-polar condition went undiagnosed until later) or when the parents divorce. The overly consumed father is displayed by Chiron in Aries in the 12th house. (There is a suggestion with this Chiron in Aries chart signature that even if time between father and son was short, it was likely of good quality.) The mother’s free spirit, her private struggles, and her bi-polar condition is described by Chiron in Aries conjunct the moon opposing Uranus in Libra. To be sure, a family divorce is hard on every child. As his nanny was quoted as saying: “Justin is a mommy’s boy, so it’s not easy, but children’s hurts mend very quickly. 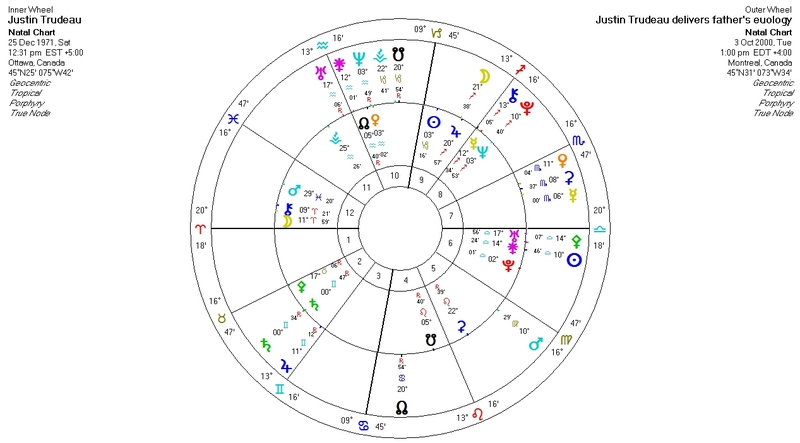 And they’re lucky kids, anyway.” Despite the deep emotional trauma, Justin’s twelfth house moon/Chiron conjunction and Aries rising along suggests the ability for a quick bounce back. (This ability is also seen by the fire trines of the chart: the south node and Ceres in Leo; Neptune, Mercury and Jupiter in Sagittarius; Chiron, Moon and Ascendant in Aries). Along with this fire trine, Venus conjunct the north node also suggests that the parents divorce proved beneficial and liberating for all concerned. In October 2000, then 28 years old and experiencing his Saturn return, gained the attention of the nation for his moving eulogy to his father. So many requests to re-broadcast this eulogy poured in to the CBC that a leading Quebec politician (Claude Ryan) described it as “perhaps the first manifestation of a dynasty”. His eulogy was later listed in a book issued by the CBC (2003) as one of the most significant of Canadian events from the past fifty years. After his father’s death, Justin became more politically active. 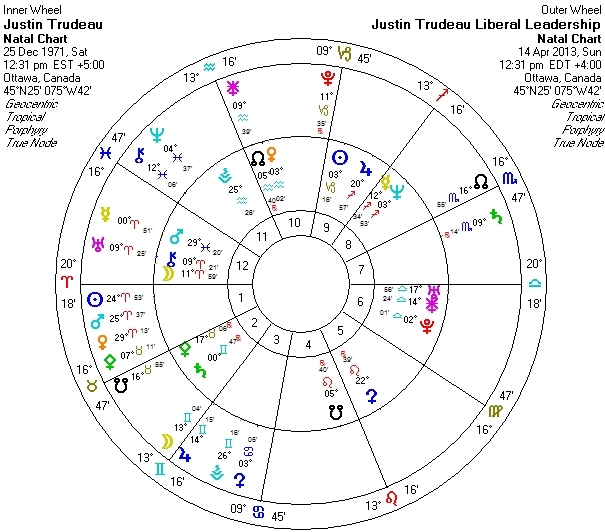 Justin’s father died while transiting Jupiter opposed transiting Chiron/Pluto. Both Chiron and Jupiter are archetypes for the father; Pluto is associated with death and reincarnation. 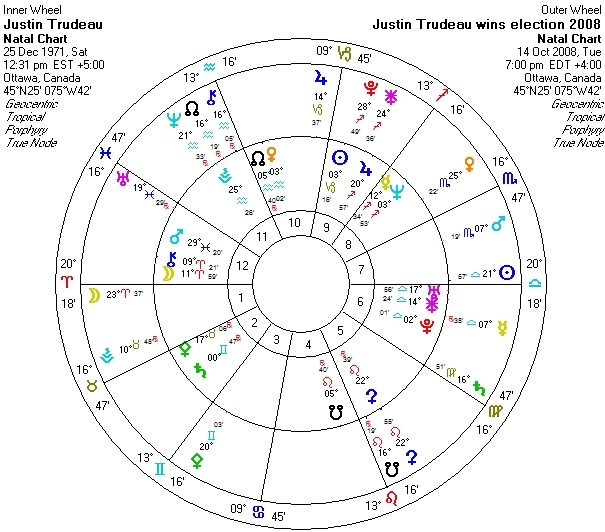 Justin was first elected to the House of Commons in 2008 when Chiron in Aquarius was retrograde and transiting the north node, a relive and/or fruition transit. The transit of Chiron/north node (transiting his 11th house) was also within one degree trine to his natal Uranus in Libra in the 6th house. Uranus, Aquarius, and the 11th house are signatures of politics, the sixth house of work and of service. Trudeau won the leadership of the Liberal Party in April 2013 and in another first, went on to lead his party to victory in the 2015 federal election, moving the third-placed Liberals from 36 seats to 184 seats, the largest-ever numerical increase by a party in a Canadian election. Transiting moon conjunct transiting Jupiter in Gemini opposition Justin’s Mercury and natal Jupiter – aspects that show great hope for the future and also an intention to rebuild and regain the Liberal’s influence and popularity. A charismatic, personable figure with great social charm, he has been called “hyper social” by one in his inner circle. Throughout his election campaigning and his first days officially on the job, Justin has demonstrated great openness, spontaneity, and patience with dealing with the public. During the leadership debates he was at times heated, but rather than it working against him as some of the media speculated at the time, he appeared even more relatable as he became the mouth piece for the general public sentiments of the anger and frustration toward what has been dubbed “the Harper regime”. He has shown grace and courage under pressure when confronted by the media. “They have a right to ask the tough questions” he has said. On the first day in office he has already shown a stark contrast (Chiron in Aries opposing Uranus) to the partisan social standards of previous government. He even made time to hold an internet meeting with a group of elementary school children. Those with strong Chiron signatures are marked for a destined life. Chiron in the 12th house is a signature for a social icon and/or an iconic life. Trudeau displays the idealism that is fresh, vibrant, courageous and at this moment, undaunted. He has raised the hope and faith (12th house) of a nation. We have yet to see if he can deliver on a promise, but, so far, so good.